The Eggs of the mythical Rainbow Serpent. A place of ancient Aboriginal dreaming. Local legend believes the Devils Marbles are the eggs of the mythical Rainbow Serpent who controls life’s most precious resource in the central desert – water. The Devils Marbles is one of the most extraordinary landscapes in the Outback and one of Australia’s most famous natural wonders. The Devils Marbles are known as ‘Karlu Karlu‘ by the local Warumungu Aboriginal people. Karlu Karlu means ’round boulders’ in the language of the local Warumungu Aboriginal people. The Devils Marbles Conservation Reserve is 1802 hectares in size and stretches from horizon to horizon. You will find the Devils Marbles just 410 kilometres north of Alice Springs, and 1090 kilometres south of Darwin in the Northern Territory outback. 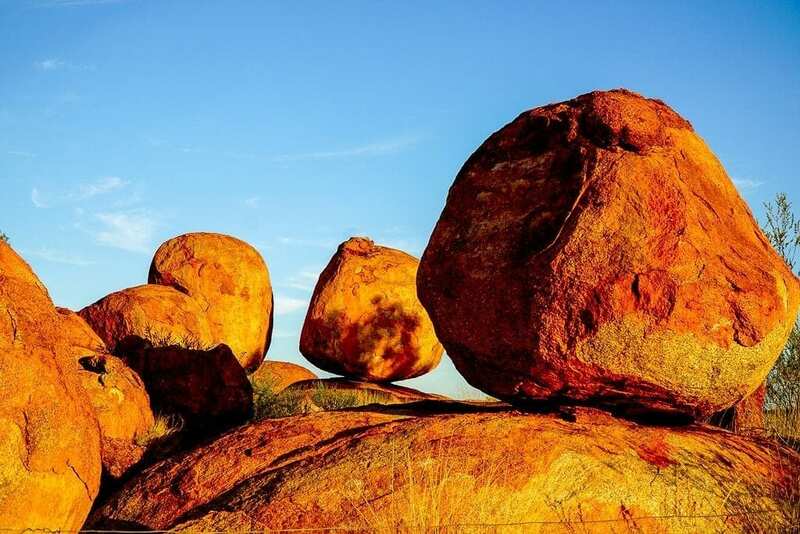 They appear as a vision of granite boulders seemingly strewn across acres of sparse desert country as you drive through the Northern Territory. The Stuart Highway cuts through the midst of the Devils Marbles Conservation Reserve. Stop. Take a break and wander through this extraordinary landscape. There are story boards throughout the park which explain the formation of Karlu Karlu and information about the Aboriginal legends and the mythology of this unique landscape. Simply put, approximately 4 hours north of Alice Springs and 12 hours south of Darwin. The Devils Marbles are in the middle of absolutely nowhere, but they truly are one of the most impressive natural landscapes to be seen. Erosion has played a significant part in developing this landscape. Over time, the blocks of granite have developed horizontal and vertical cracks, splitting into many rectangular blocks and with millions of years of wind and rain eroding them into the magnificent boulders that you see today. Varying in size, some of the Marbles are up to seven metres in diameter and many of the boulders appear to be precariously balanced on top of each other. Every marble is different and the colours are rich and vibrant and change in intensity with the sunrise and sunsets. Join a guided walk through these spherical boulders and learn about the ancient Aboriginal spiritual lands of the region. The dreaming story of the Devils Marbles or ‘Karlu Karlu’ to the local Warmungu Aboriginal people tells of the belief that the marbles are fossilized eggs of the Rainbow Serpent. Formed over millions of years these rocks continue to crack and move with time and mother nature. It’s one of the most spectacular places in the Territory to experience sunset. The rich golds and reds create a stunning selection of colours against the rich blue evening sky. Walking through the Devils Marbles in the evening is a surreal experience and one of the ‘must do’ things of a lifetime! It’s fun to watch the tourists photo-pose themselves attempting to push over or lift one the marbles … shhh, I have some of those photos too! The Devils Marbles Conservation Reserve offers a variety of habitats for unique desert flora and fauna. Exposed sunny areas, shady areas and dark and moist shelters provide cool shelter habitats for many different species of snakes, lizards, goannas and birds. The Barkley Tablelands is where you will find vivid blue skies, striking scenery and abundant wildlife. You will see plenty of native birdlife such as cockatoos, corollas, ibis and bush turkeys. Wallabies, emus, kangaroos, dingos and numerous rodents and marsupials live in this natural habitat so keep your eyes peeled. You may also be lucky enough to see prehistoric goannas, lizards and predatory birds such as kites and eagles soaring above. A visit to the Devils Marbles early morning and late afternoon will reward you with a stunning range of red and gold colours. Take advantage of the golden hour. Be sure to time your visit at sunrise or sunset or if you can, stay nearby or opt to camp overnight to experience this spiritual place. It is the time of day when the landscape comes to life. The nearby Davenport Range National Park is an important refuge for fauna, especially water birds, due to this extensive network of permanent waterholes. Budding birdwatchers and serious ornithologists head to this national park to catch sight of the vast numbers of birds found in the area. The Davenport Ranges are strictly 4×4 country. If you want to experience the hidden beauty of the Tennant Creek region you will be rewarded by a network of permanent waterholes and extraordinary views from remote rocky outcrops. Be prepared to pitch a tent or roll out a swag to enjoy this remote haven. There are no ‘creature comforts’ here in the outback. This country is an amazing ancient landscape! Every time I travel through the Devils Marbles, I stop to take another photo. Just like every other tourist! Stop in for one of their fabulous steak sandwiches! Stop in for sunset at the Devils Marbles and spend the night at the Devils Marbles Hotel. Just 8 kilometres south of the Marbles you will find this quirky little hotel. There’s a range of accommodation to suit most people’s needs and it’s a friendly little place to drop in for a meal and stay the night. Tennant Creek is 110 km to the north of the Devils Marbles with a population of approximately 8,000 people. It is the 5th largest town along the Stuart highway. Tennant Creek has a busy community presence as the service hub for surrounding cattle stations, travelers passing through and the local township. It’s an interesting little town founded in the early days of the Northern Territory goldrush. Camping at the Devils Marbles is one of the great outback experiences. The quietness of desert at night is calming and the night skies are full of stars. If you’re camping overnight the campground offers basic camping facilities with picnic tables and barbecue pits. The rocks, cultural items and wildlife within the Devils Marbles Conservation Reserve are protected. Camping fees are via an honesty system. Pets are permitted on a leash in the day parking area only. Pets are not permitted in the campground. Did you enjoy this post? Share to your Pinterest feed. The Devils Marbles – Have you been there yet? Aren’t they stunning? Did you stay for sunset or arrive at sunrise? Care to share your experience below? What's not to love about traveling, good food, great wines and a stress-free lifestyle. Join me as I share our adventures, inspirations and ahha moments! Sign up for our latest adventures, travel and photography tips and musings.